There are many ways to record audio on your computer. You might consider using Audacity if you are having issues with PowerPoint providing reliable recordings. 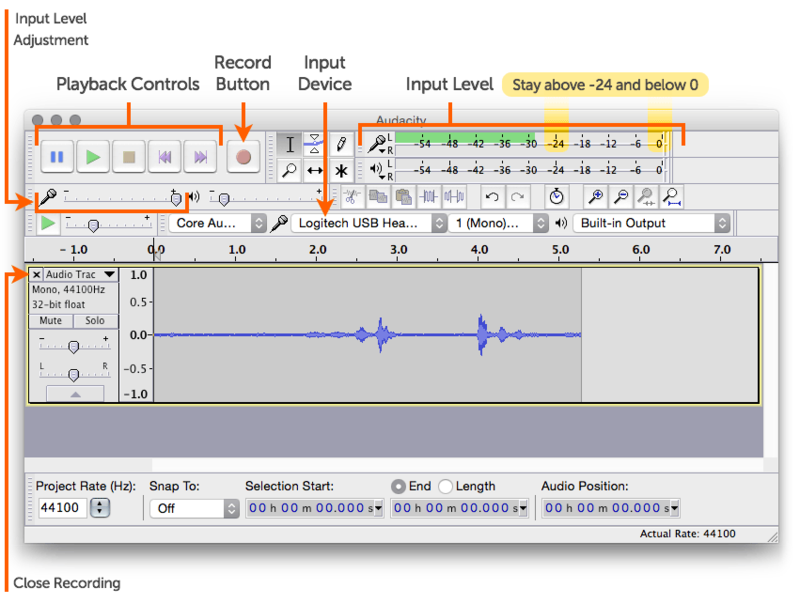 Audacity is a free, open-source audio recording and editing application. It runs on Mac, Windows, and Linux. This document will walk you through how to get Audacity and the basics of recording your Narration with it. It contains screenshots taken on a Mac. For our purposes, the interface is generally the same on all platforms. Click the large Download Audacity #.#.# link at the top of the page to download the latest version of Audacity for your computer. This should download the latest version of Audacity that is available for your platform. Navigate to your downloads folder to find your download, and install Audacity. Follow the instructions presented for your particular platform. First – Connect your Microphone. You need to have your Microphone connected before launching Audacity. Before recording be sure to always verify that your headset is the active Input Device. In most cases, this is the headset CEOEL provided for you. You can see the active Input Device in the main interface above. We strongly ask that you record one audio file per slide instead of doing your entire presentation in one long recording. This allows you to easily re-record the content for a specific slide in case of any errors. This allows for easy multi-session recordings. And most importantly it provides clear organization of your audio content for the Media Team. Remember that we have to match up this audio with individual slides. When you are ready, click the Record Button to begin recording. When you are finished with the narration for the slide, click the Stop Button to end recording. Preview your recording by clicking the Play Button. It is always important to preview your recordings. Once you have recorded a slide open the File menu and choose Export Audio…. Save the recording into a folder for your presentation. Save it in wav format, and name the file sequentially. For example: audio01.wav, audio02.wav each corresponding to a specific slide number. Once you have recorded a sound file for each slide, you are finished. Published on June 15, 2015 at 5:04:47 pm CDT. Last modified on June 06, 2018 at 4:12:28 pm CDT.